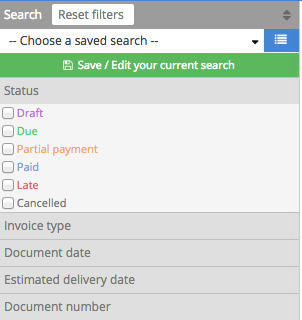 Sellsy has several tools to remind your clients about late invoices in an efficient way. What is the most efficient way to use Sellsy reminders? This really depends on your relationship with your client. The best approach is to have a gradual response: a reminder email a few days before the invoice due date, followed by a simple email a few days after. Putting a client in default should be your last resort. Putting your client in default can be a very difficult experience. If this is your only option, you will have to defend your case in court. Your late invoices will show up immediately. You can send a reminder in just one click by clicking on the red clock icon at the end of every line. You can also open the document and click on the Late reminder icon. In the pop-up window, you can choose what kind of reminder you want to send. If you choose to remind your customer by email, you will be redirected to the Sellsy email window that you have used in the past. You can modify the email before sending. You also have the option to include your scanned signature, if you already downloaded it beforehand in Settings > My Profil > My signature.